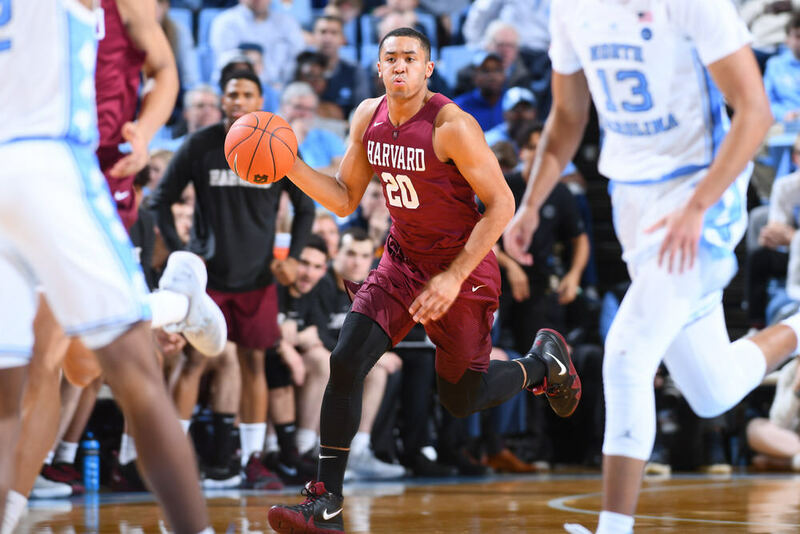 Tommy Amaker identifies Justin Bassey ’20 (shown here against North Carolina) as the team's most valuable player. Bassey is the team’s best perimeter defender. Bassey has taken on a larger offensive role and is the team’s fourth-leading scorer, averaging 10.3 points per game. Amaker has said that Bassey “may not have been voted captain—yet” to emphasize his important leadership role on the team. 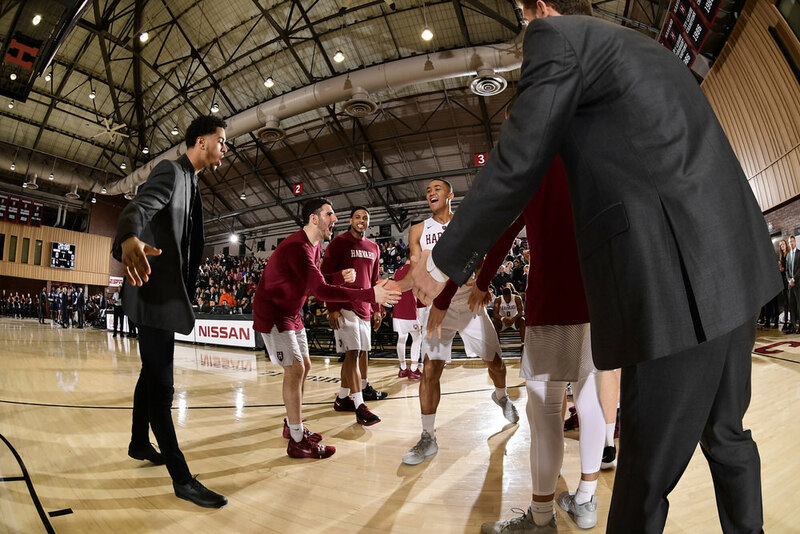 In the summer of 2017, men’s basketball assistant coach Brian Eskildsen was on vacation in Rome, eating a gelato, when he heard someone shout, “Eski?” He looked up to see Justin Bassey ’20 smiling back at him. The encounter was pure coincidence—Eskildsen’s vacation with his fiancée had landed him on the same street where Bassey was sightseeing with his family—but it was also strangely familiar. Three summers earlier, Eskildsen had discovered Bassey by chance at an Amateur Athletic Union (AAU ) tournament in Las Vegas. The coach was there to scout Chris Lewis, a highly touted prospect, and decided to stick around to watch Bassey, another name he’d heard mentioned. He liked what he saw. Bassey’s energy stood out, along with his athleticism and size (he is a six-foot-five, 215-pound guard)—all attributes Stemberg coach Tommy Amaker prizes in perimeter defenders. The son of Thai and Nigerian immigrants, Bassey also had straight As in AP classes at Colorado Academy, an elite Denver private school. The coach remembers thinking, “This is a Harvard kid.” The attraction was mutual, and in March 2015, Bassey joined Lewis as the team’s second recruit in the class of 2020. And he did. To date, Bassey has played the most minutes of any of his fellow 2020 recruits. He was an Ivy League honorable mention designee last year, and Amaker typically relies on him to guard the opponent’s best perimeter player. He averages 10.3 points per game and is the team’s leading rebounder. Amaker calls Bassey the Crimson’s most valuable player. How did an overlooked shooting guard become Harvard’s MVP, and why might he hold the key to whether the Crimson can return to the NCAA tournament for the first time since 2015? Bassey may have landed on Harvard’s radar by chance, but his pursuit of basketball has been highly intentional. His mother, Sue, recalls his saying in kindergarten that he wanted to be an NBA player. He practiced intensely, enlisting his sister, Annika, now a freshman on the Harvard women’s tennis team, to help rebound. Bassey’s AAU coach, Sean Nolan, marvels that he started dunking in eighth grade. He also became a prodigious scorer, leading Colorado Academy to state championship appearances in his sophomore and junior years. By the time he graduated, he was the eighth-leading scorer in Colorado high-school basketball history—six spots ahead of former NBA All Star Chauncey Billups. An elite player from a state not known for basketball, Bassey attracted early interest from regional mid-major programs like Air Force and Wyoming. After Harvard got involved, Indiana, Gonzaga, Creighton, and other Ivy League schools showed interest. Harvard’s academics and competitive success (he watched the Crimson’s near-upset of North Carolina in the 2015 NCAA tournament shortly before committing) were attractive to Bassey, and he had the sense that he could lead a balanced life in Cambridge. On a campus visit, he stayed with Corbin Miller (’15) ’17, and they played piano with friends in the dorm. It felt right. His freshman season started more slowly than he’d hoped. 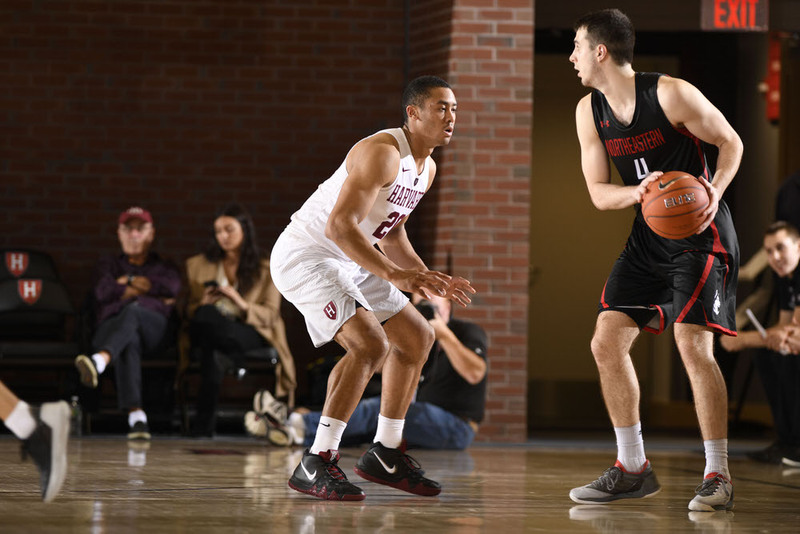 After playing nine minutes in the opener against MIT, a Division III opponent, Bassey did not play at all in Harvard’s game against Stanford in Shanghai. But teammate Zena Edosomwan ’17, a senior All-Ivy post player, told Bassey his opportunity would come. He did not have to wait long: returning home to play Fisher College, Bassey started and scored 14 points in a 78-51 win. The game allowed Bassey to “catch his breath and say, ‘I can do this.’” But that one performance did not guarantee future playing time. Fisher was a Division II opponent, and Chambers, one of Harvard’s top backcourt players, had been injured. To cement his place on the court, Bassey would have to fill an unmet need. Amaker needed tall, athletic guards who could be versatile perimeter defenders. Bassey fit the bill, not only because of his size and athleticism but also because of his toughness and effort. In non-conference play, he helped contain prolific scorers, such as Boston College’s Jerome Robinson (the thirteenth pick in the 2018 NBA draft). Playing Ivy teams, however, required an adjustment. They often run sophisticated “split action,” Bassey explains, which means extensive movement, screens, and cuts off of the ball. He would have to sharpen his focus—a lesson he learned the hard way that first season in a game against Princeton. Harvard led 56-53 with seven seconds left, when the Tigers’ Myles Stephens drove to the basket. Bassey slid over to take a charge but committed a blocking foul. He then failed to box out Princeton’s Steven Cook on the free throw. Cook got the rebound and the put-back to give the Tigers an improbable 57-56 win. Afterward, the upperclassmen reminded him of something he had done well—a team-high 10 rebounds. And the experience helped teach him something else, too: how much Harvard basketball meant to everyone on the team. There were tears in the locker room after practices, and intense moments during practice. He had to excel for his teammates. Bassey had another unplanned encounter with Crimson team members that summer of 2017: while staying in Southern California, Bassey went to the Los Angeles Clippers practice facility to visit John Welch, a Clippers assistant who had worked with the Nuggets and with whom he had trained growing up. Unexpectedly, Aiken showed up with one of his mentors, Kyrie Irving (they both attended the Patrick School in New Jersey), who now plays for the Boston Celtics. Before long, teams formed up, and Bassey’s squad (which included Sean Nolan, his AAU coach; Welch’s son, Riley; and one other player) beat Irving’s team (which had Aiken, a former Duke player, and one of Irving’s close friends) in a best-of-seven series, including an 11-0 shellacking in the opening game. “We smoked ’em,” Bassey says. Those pickup games came amid Bassey’s summer-long effort to improve his offense, especially using ball screens, a point of emphasis for Amaker. During the guard’s freshman year, Harvard coaches had encouraged post players to “slip” screens for him, meaning they would begin setting a pick before cutting hard to the basket. This was an effective decoy, but it reflected Bassey’s uncertainty when reading defenses. The coaches needed him to embrace a bigger offensive role. He had been honing his skills with Miller, his onetime campus host, who helped Bassey refine his mid-range pull-up jumper. Over the summer, he called for ball screens while playing pickup. He was learning to evaluate what defenders off the ball were doing. During his sophomore year, he at first struggled to apply this knowledge. In an early loss to Northeastern, he scored only six points. 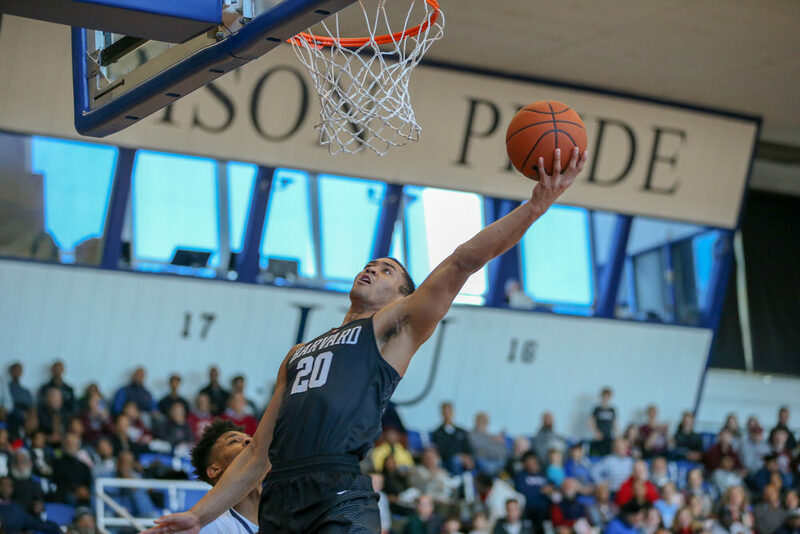 But in the following weeks, he found balance, blocking a shot late in the game to help seal a 54-52 victory at Yale, and then hitting two late threes against Princeton to help secure another win. After Towns was injured in the Ivy League tournament final, Bassey led the team with 19 points in the National Invitational Tournament game against Marquette. He had become an important part of the attack. This season began with Aiken and Towns still recovering from injuries, and the Crimson has struggled, beating MIT by an uncomfortably close margin (78-66) and losing 81-71 to Northeastern. To Bassey, the team’s mood seemed off. For the first time in seven seasons, Harvard has no players from an NCAA tournament team. In a frank conversation, Amaker told Bassey he needed to become a stronger leader; the coach needed someone to reinforce and maintain a championship culture. For now, Bassey—an economics concentrator who volunteers as a Big Brother—is focused on this season. He will be back in uniform and in the lineup for tonight’s game. If the team can notch two wins this weekend, the Crimson (16-9 overall, 9-3 Ivy) would earn at least a share of the conference championship and the top seed in the Ivy League tournament. Two more wins there, and the team would return to the NCAAs. To Bassey, this is an opportunity for his class to shape its legacy, which, he acknowledged, has so far “underwhelmed” those early forecasts. The team would do well to follow his lead: he knows a thing or two about exceeding expectations.